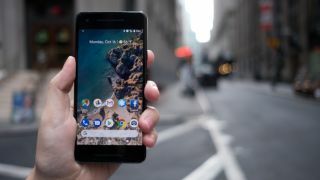 Google appears to have inadvertently shared the launch date for its long-awaited Pixel 3 smartphone – and is apparently looking for ‘influencers’ to review the phone for up to $10,000 a pop. YouTuber Brandon Lee shared an advert posted from Google’s Famebit site on his channel This Is Tech Today. The ad mentions a Google Pixel 3 launch date of October 4, and says Google is looking for Canadian influencers to review the new phone, in a move some are interpreting as an imitation of Apple’s marketing techniques. When Apple launched the iPhone X last year, it shunned traditional technology reviewers in favor of Youtube influencers in a bid to connect with a younger demographic, which left some reviewers feeling a little sidelined. This isn’t the only way in which Google appears to be imitating Apple, as it added notch support to the Android P, the upcoming ninth version of the Android operating system. Not only that, but it seems the new navigation system for Android P is remarkably similar to the iPhone X’s intuitive gestures. It’s important to note that the launch date isn’t a confirmation of when the Pixel 3 will be available in stores – most likely, it’s the date the phone will be officially announced. Other rumored features for the Pixel 3 include dual front-facing cameras, wireless charging, and Active Edge, meaning that it would be possible to squeeze the sides of the device to activate Google Assistant, silence alarms, and more.